Nice slow day with friends and leftover cornbread after chili party. I love our house, and I’m getting so spoiled by the cleanliness! I love that @mikegrundy is reading The Long Winter to the boys at bedtime. We are with you @HalfPintIngalls! We are making chili for the party tomorrow and it is all from scratch: home canned tomatoes, salsa, and @ranchogordo beans. I can’t wait! it’s raining! and my first thought is: OH GOOD, my car was so dirty it was getting *crispy. * This will help! in the last 24 hrs I’ve developed an excruciating neck cold. It is zero (count it!) zero fun. mike and the boys were excited to screen for me “strange brew,” as I hadn’t seen it. I love that our dorky family finds that movie so funny! Um. By gatling, I mean garlicy. I blame the sounds of Eleven playing a 1st person zombie shoot’em-up. Pickles ae GARLICY. guns are Gatling. Just cracked open my first dill pickle attempt. And they are awesome! So Gatling and spicy! One of the things that I liked best about my partner was how he immediately jumped to very cute conclusions on our third date and said in a moment of non-smooching: “You’re not meeting the kids for at least six months.” I think my response was something a long the lines of: “that’s for damn sure!” I hate to sound smug and loverly but we clicked right away, and we tried as hard as we could to drag our heels to prolong the inevitability of shacking up and living blissfully together forever-after. And the kids thing was a big deal. For sure, I was immediately concerned with protecting the kids. Part of that is my own damage – I didn’t want any poor innocent to be visited upon by the future specter of The Classic Abandonment Complex, you know? At least not at my hands. So no matter what my partner said, I wouldn’t have met them until I was rock-solid sure that we were going to work out. It’s not like that for everyone, many people are sure right away, and many kids are used to meeting new people, and they are used to their parents having friends who might be romantical. My friendly receptionist at work thought it was insane to wait for so long. 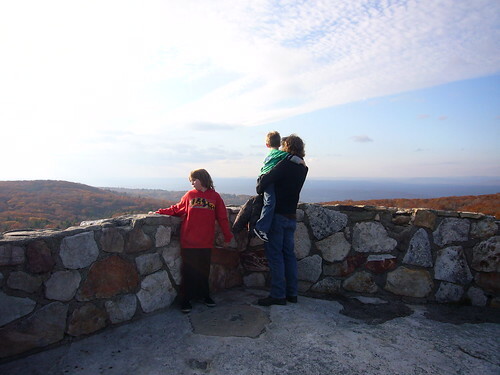 She thought that if my partner was really committing to me, he would immediately share his children with me, and not keep that part of his life separated. but it wasn’t about ME, so I didn’t think that would be appropriate. And it was more valuable to me to recognize that he was serious about making sure his little dudes weren’t negatively impacted by any new ladies – serious enough to inconvenience us all as we tried to accommodate his full child-time schedule around our full getting-to-know-one-another schedule. It was important, though, that we had a timeframe and a plan. We started seeing each other in March. In September, my partner decided to have a housewarming party and invited an awkward-for-me mix of his local friends, consisting mainly of his ex’s cousins and second cousins. Also the boys were there, but there were enough “new faces” that I don’t think they clued in to my specialness. 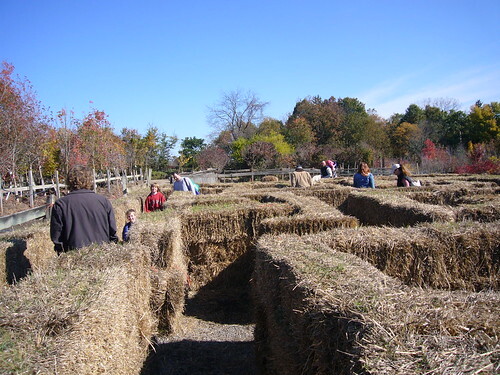 And then a month later we managed to plan a family-type trip to the local pumpkin patch, and we had a nice time picking out pumpkins and trying out the hay maze, and carving pumpkins. and going to local museums together. Eventually the boys got more used to me. There wasn’t any serious conversations ala Boys, Kari is my new GIRLFRIEND and you need to be nice to her, which I think had as much to do with the fact that I was the first new lady to be brought around as anything else. I really lucked out, y’all: this was no-drama because I hadn’t been preceded by any drama. The kids had just gotten used to their dad having a new house, and not living with their mom any more. They hadn’t had to meet any Baronesses with plans to send them to boarding school. I was non-threatening, I didn’t start bossing them around, and to be honest I don’t think that their dad and I kissed around them for an exceptionally long time. Plus their mother had a “friend” start to hang around at the same time, so there wasn’t really a chance for split-loyalties. And now the kids and I have these crazy conversations. We can’t believe that we’ve known each other for so long. I will run through the timeline with them: Your dad bought this house three years ago this month. I didn’t meet him until a month after that. I didn’t meet YOU for another seven months. Can you believe it? it seems so long ago! How crazy that we haven’t always known each other. If you’ve got little snickerdoodles, how long did you wait before meeting them? Wind isn’t howling any more, it’s freight-training. I’m so glad the roofer is essentially done and we don’t have to worry about lift-off. the wind is howling but we had delicious mexican lasagna for dinner, and looking forward to leftovers-rice pudding. I think we’ll make it. I ate excessive amounts of yum pickled garlic last night w. unfortunate results today. Apologies to the dudes on the treadmills behind me. I guess it’s times like this that I really miss having a television. Oh, to be watching the Westminster Kennel Club right now! 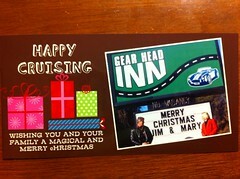 we got this xmas card from the motor inn we stayed at during our awesome Eleven States in Eleven Days motorcycle trip. So sweet! I highly highly highly recommend the Gear Head Inn.